The clear external forms of the rockresort are also taken up in the apartments. Natural materials are used in the furnishings, which ideally complement the precise architectural lines of the resort. The bedrooms are lined with untreated solid oak wood, the walls and floors in the living area are made of lime marsh and concrete. The modern apartments offer living quality at the highest level – restaurants and shops are in the immediate vicinity. Enjoy the high-quality furnishings, the comprehensive service concept, the direct location at the valley station and not least the great variety of the Flims Laax Falera region. 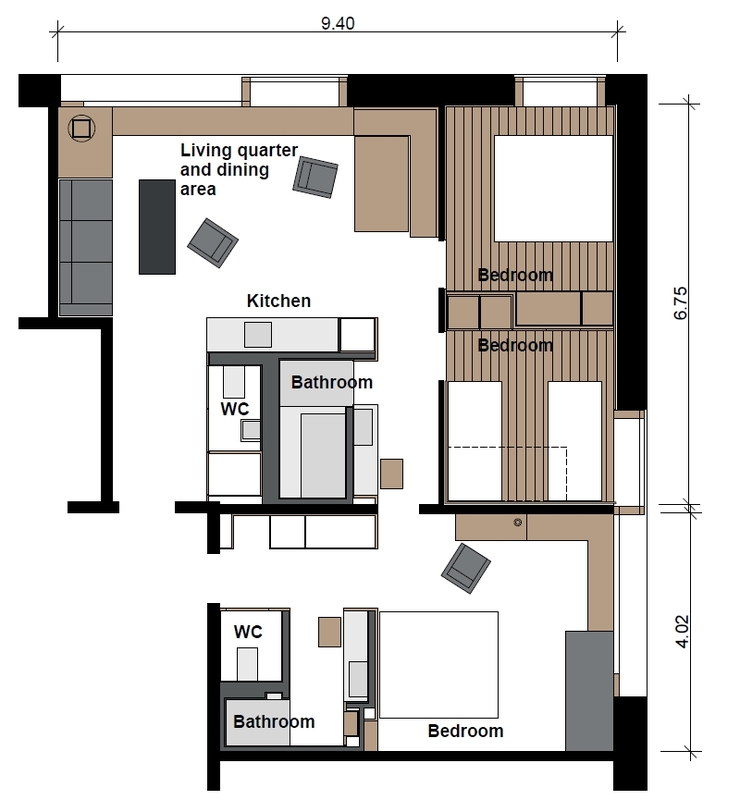 Two bedrooms with 4 to maximum 5 beds, living room, bathroom with mini spa, separate toilet and fully equipped kitchen. 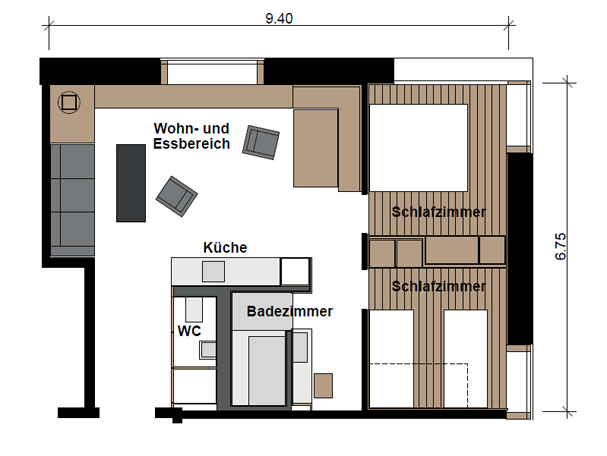 Double room in Maiensäss style (without windows). Three bedrooms with 6 beds, living room, two bathrooms with one mini spa and one shower, two separate WCs and a fully equipped kitchen. 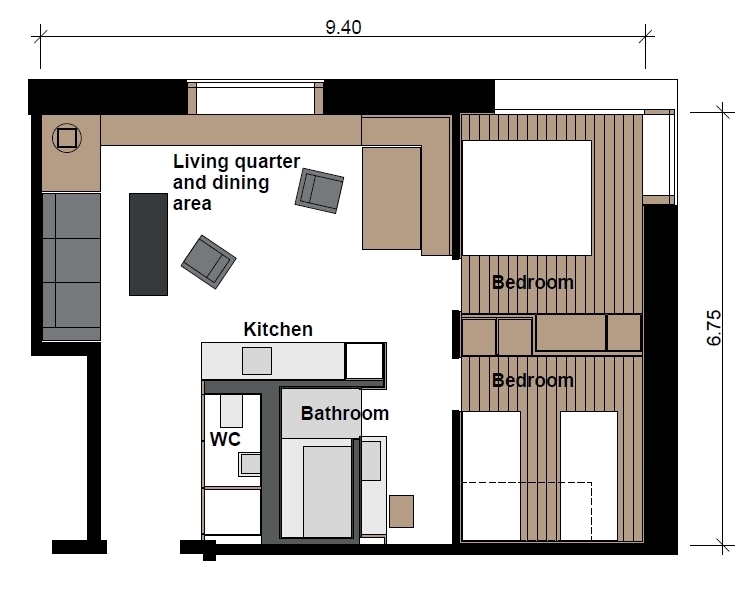 Four bedrooms with 8 to a maximum of 10 beds, living room, two bathrooms with one mini spa and one shower, two separate WCs and a fully equipped kitchen. Whether with family or friends – our modern suites and double rooms offer living quality at the highest level. Bars and shops are in the immediate vicinity.